Power or energy is generated in a power plant which is the place where power is generated from a given source. Actually the term “generated” in the previous sentence is a misnomer since energy cannot be created or destroyed but merely changed from one form to the other. More correctly, a power plant can be said to be a place where electrical energy is obtained by converting some other form of energy. The type of energy converted depends on what type of power plant is being considered. Conventional power plants use conventional sources of energy while non-conventional power plants utilize non-conventional sources of energy. They include the generation of electricity from conventional sources of energy. These resources are finite and exhaustible. Once consumed, these sources cannot be replaced by others. Examples include coal, timber, petroleum, lignite, natural gas, fossil fuels, nuclear fuels etc. The non-conventional sources of energy are being continuously produced in nature and are not exhaustible. Examples include wood, geothermal energy, wind energy, tidal energy, nuclear fusion, biomass, solar energy etc. The following are the power plants from non-conventional sources of energy. Let us have a look in these types of power stations in detail. As the name suggests, these power plants convert heat energy into electrical energy. The working fluid of these plants is mostly steam and they work on the Rankine cycle. 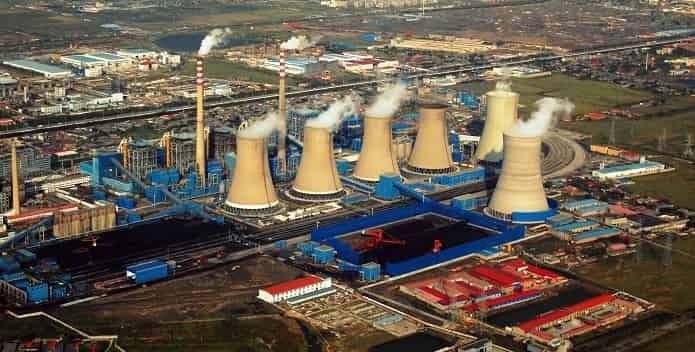 A steam power plant consists of a boiler which is used to generate the steam from water, a prime mover like a steam turbine to convert the enthalpy of the steam into rotary motion of the turbine which is linked to the alternator to produce electricity. The steam is again condensed in the condenser and fed to the boiler again. Hydro-Electric Power plants use the kinetic energy of flowing water to rotate the turbine blades, hence converting kinetic energy into electrical energy. These types of power plants are very good for peak loads. Their main disadvantage lies in the fact that their location depends on a number of factors which are beyond the control of human beings such as the hydrological cycle of the region and so forth. If there is shortage of water it could lead to shut down of these plants. For this reason alternative arrangements such as thermal power plants need to be made to ensure uninterrupted generation of power.